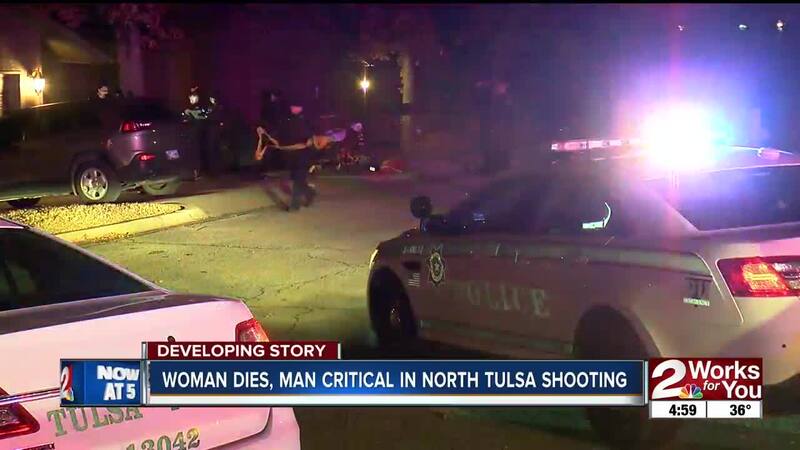 TULSA — A woman has died after a double shooting early Friday morning in the Gilcrease Hills neighborhood. Tulsa Police said a call came in at 2:22 a.m. about a shooting at home in the 1600 block of North 23rd West Avenue. The situation involved a woman, her ex-husband and possibly her boyfriend, according to TPD. Officers said when they arrived they found the boyfriend in the driveway with a gunshot wound to the abdomen. When they went inside, the ex-husband immediately told police that he was staying at the home for the night, the boyfriend forced his way inside and he shot the boyfriend. The woman was also struck in the head by gunfire. Both she and the boyfriend were taken to the hospital in critical condition. The woman later was pronounced dead. The ex-husband was taken downtown for questioning. Police have not said that anyone has been placed under arrest. Officers said two children were inside the home at the time of the shooting. They were not hurt. Officers are looking for a safe place to take them.